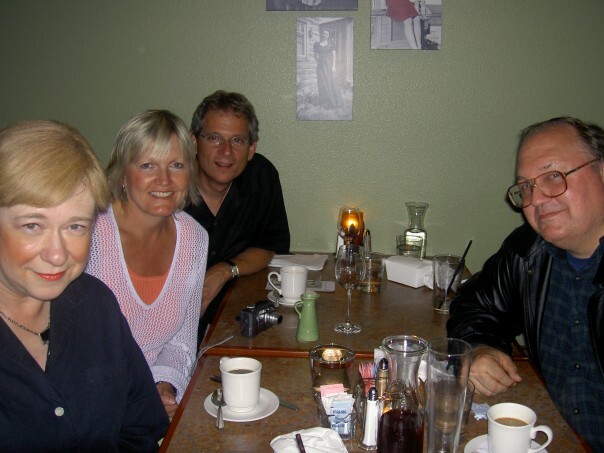 Dinner out with Sharon (lower left) and the Cauters, while back visiting from college. 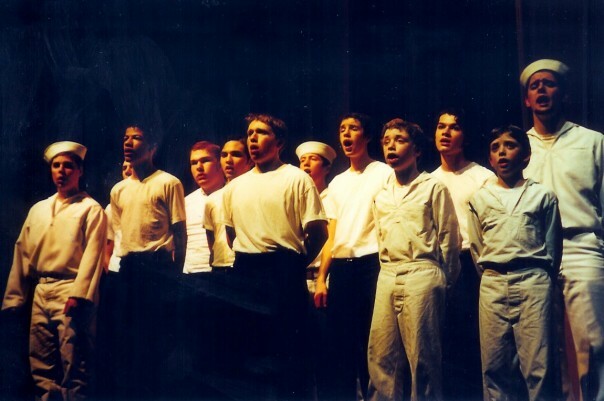 Today I’m remembering a teacher, mentor, friend, and drama director. I never had an actual class from this person, but I learned so much from her. Though I never had a class from her, I probably spent more time in her unofficial classroom, than just about anywhere else in junior high and high school, outside of the music buildings. Today I’m remembering Sharon Ferguson, a dear friend who passed away after a number of health battles. I wasn’t ever the most talented actor, certainly not the most gifted dancer, nor ever the best singer on the stage, but somehow Sharon always found a way to encourage me to grow and to try new things. 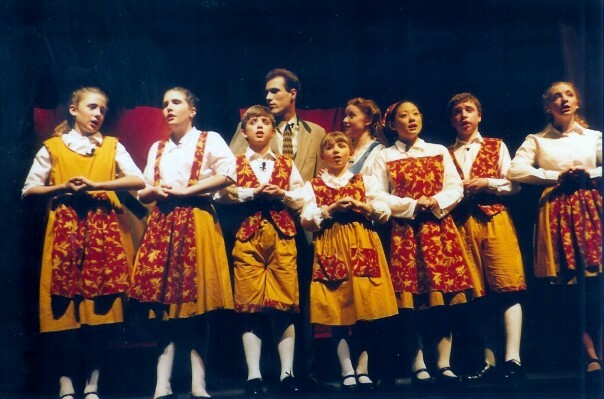 I started by being one of the younger cast members while I in seventh grade by playing a child in “The Music Man.” The next year I got to be a sailor in “Anything Goes.”In 9th grade I got to be part of the Von Trapp family, joining my brother Thomas as the two brothers in the show- Frederich and Kurt. That was a highlight to be sure, but the next year, was hilarious. 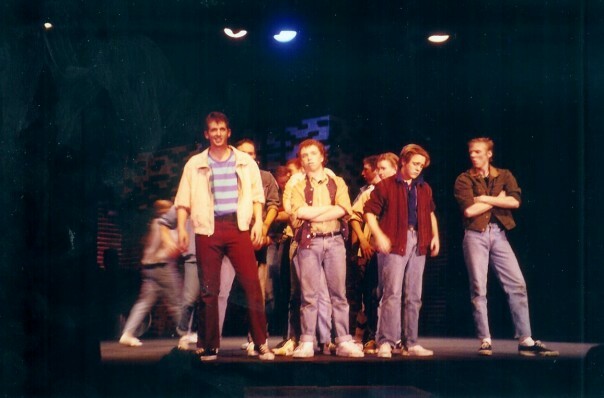 In sophomore year I ended up being cast as Diesel in “West Side Story.” If you are not familiar with that show, that role is kind of the muscle man for the Jets. There were a number of skeptical looks, including from my friend Skip, Sharon’s long-time choreographer. But somehow, I didn’t totally fail at that part, and I think pulled off the tough guy. 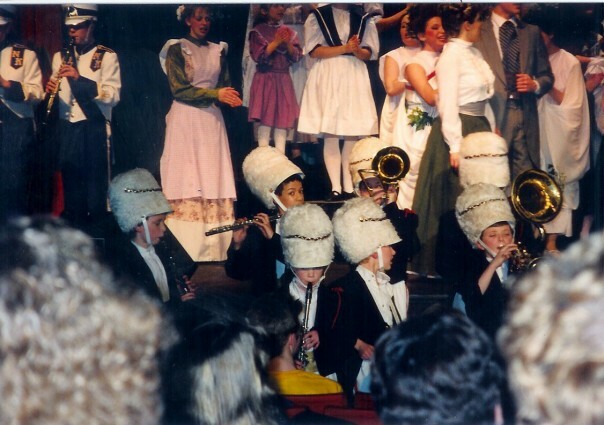 There were some other shows that I helped out with over the years, including getting to witness Sharon turn my sister into a dominating Wicked Witch in ‘The Wizard of Oz.” Sharon just had a way to bring out the best in people on the stage, and to coach them into finding something about themselves that they didn’t know before. She was able to push people to help them grow, while walking the fine line of having a sympathetic ear but also that of a leader on a tight schedule. There’s so much more than this though. Even though Sharon retired before I ever had an actual class for credit from her, she offered outside learning for some students who wanted to be pushed- particularly in areas related to English, literature, and drama. I learned outside of the classroom through her wisdom. When the time came to consider college, Sharon was the first person other than family who told me that they wanted to be a letter writer for me and to be able to edit and go through all of my college essays with a fine tooth comb. I am grateful for those edits, and the results obviously worked out well too. As time went on, my family learned that there were other connections that we had with Sharon. Perhaps the best story involves my grandma and grandpa’s cat Josie. We didn’t realize this right away, but after a few years, we figured it out that Josie was one of the kittens from one of Sharon’s former cats, years ago. Outside of school and cats, there were plenty of family gatherings over the years which Sharon was a part of. She was always there, part of the scene and the group of people cheering my brother, sister, and me on. Though I didn’t really see her in church, I was often able to talk about the church world too and she was excited when I told her about Allison’s and my decision to attend seminary. But that’s just who Sharon was. Sharon’s sense of humor and wit was always there. She may have had the presence of a very self-assured leader from her years of service, teaching, and directing drama at North Kitsap. But behind that, I know there was a big heart which really had at its goal, helping her students see the big world that they are a part of, and feeling equipped and empowered to go out into it and find their calling. Like a great teacher, she knew when to push and when to encourage. Like a good leader, she knew how to turn up and down the temperature when needed to help people grow and be the best that they could be. Sharon’s legacy in my book is not that she put together decades of amazing dramas and musicals, though those left a lasting imprint. Her legacy is that today I can look out on Facebook, and see some of the many leaders that she shaped and helped form who are in all sorts of fields from music to software, from politics and civil service to churches and other classrooms, from Hollywood to Broadway, and everywhere in between. What mattered for Sharon was that her students were equipped, and knew that they mattered, but at the same time, that they knew the importance and willingness to be dedicated, passionate, and hard working. I’m grateful for all of the things I learned from Sharon, and for her life, service, teaching, and leadership. May all those of us who were touched by her, live as fully as she did and take what we learned as a way to help grow and serve others in all that we do.